"I have been a real estate investor for more than 10 years. It's not a job, it's a passion and a privilege." Here at RE/MAX Northland we work as a TEAM. We love to help make real estate dreams come true. We know life gets busy so let us do the work for you. When you're looking for a partner to help you negotiate the complexities of buying or selling a home, you can trust we'll work together to ensure the best service possible - from search, all the way through the closing transition. 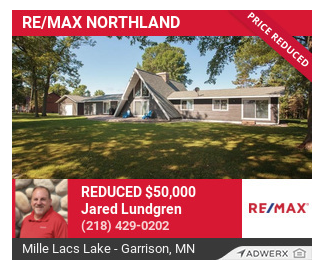 Check out current homes listed FOR SALE by RE/MAX Northland or view homes we've recently SOLD! 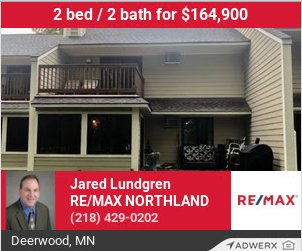 What makes RE/MAX Northland different than all the rest? OUR SALES: we are #1 with over 12 million in sales within the Aitkin Lakes Area (17 million overall) in 2018! OUR RATES: we offer commission rates as low as 5.0%! OUR LISTINGS: we provide professional photos, drone videography & virtual tours for 95% of our listings! OUR ANALYSIS: we provide a comparative market analysis to ensure top dollar for your property! OUR WARRANTY: we offer FREE home warranty coverage for as long as your home is listed with us! 1. RE/MAX Reputation - We are proud to be a part of the RE/MAX corporate team. According to the 2017 REAL Trends 500 survey, RE/MAX is the #1 name in real estate. Survey showed that RE/MAX associates outsold competing agents with a ratio of more than two to one! 2. Local Advantage - Our Aitkin team has years of experience living & serving in the local lake communities. We have the connections necessary to market and sell your home, sometimes before it even hits the market. We have thousands of contacts that we have worked with over the years. We will work together to inform the community by way of email, Facebook and other social media networks in order to drive excitement and interest! 5. Negotiating Deals with a Personal Touch - Of course, technology alone won't sell your home. Our team is lead by Broker/owner Jared Lundgren who has over 30 years of successful business & negotiating experience. Every little detail will be handled with care and constant communication.